Arnold Cunningham (Keith Gordon) is a total dork, who's only real friend is a high school jock, Dennis (John Stockwell). Arnie happens to find a junked out 1957 Plymouth Fury called Christine, and it becomes his obsession. Dennis sees his friend become colder and stranger the more time he spends with the car. He discovers the car has a dark history, the previous owner and his family all died in accidents involving it. 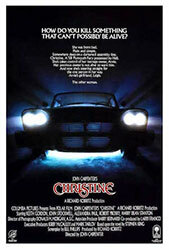 The seemingly indestructible Christine is a jealous creature and she will kill anyone who comes between her and Arnie.